Veröffentlicht am 31.08.18 um 16:41. In cooperation with the cultural department of the city of Ulm, Kunstverein Ulm initiates the event series “Herzuas. 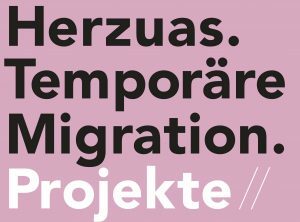 Temporary migration.” The project is based on a book by Tobias Ranker about migration to Ulm since 1945 and Ulm as an international city. The series about „Temporary migration“, concentrates on Migration in the sense of moving. Economic changes, labor market developments, and policy shifts are creating new possibilities and new constraints. Not all people plan to stay in one place; many people come to Ulm without a clear idea of a permanent home. Whether it is because of studying at the university, working temporarliy, or seeking asylum etc. how does this temporality affect the people? And how does it affect the places? Art can sharpen the view of developing phenomena and enable a new perspective. The work of many artists requires a constant repositioning or replacing of themselves, since they are permanently on the move. They leave their homeland to go further in their art. They constantly create temporary life centers (Lebensmittelpunkt). They travel to exhibitions, events, concerts, recording studios, talks, residencies, workshops, symposia, lectures, openings etc. They are global participators. Outsiders often have an alternate view of a city/space and can enrich it in various ways. Right now, participation in a collective positive development is relevant for all generations. Migration and artistic travel are a cultural heritage that have taken on insane proportions today. Digitialization enables the quick planning of the next journey, and arrangements for the next destination are made on the road. The direct and analogue has become rare, contact is instead maintained via social networks. Nevertheless, many artists are excluded because of the visa hurdle outside Europe. Those who can actively participate in the art and music scenes are often in a constant state of suspension, what’s next? What’s the next goal? To open our series we invited Rob Frye, Chicago with Flux Bikes. Hi Rob, whats your project Flux Bikes about? Flux Bikes is about flow, change, and forward motion. Its about what you can do with a bicycle. 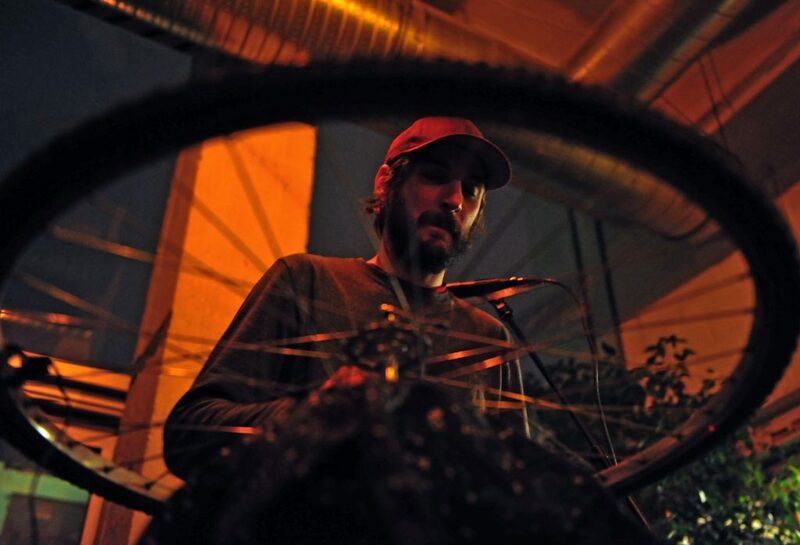 The wheel can be used as a percussion instrument; Rubber tires, metal rims and spokes. But most importantly you can ride it! What does flux bikes mean? To me it means going on a bike ride and knowing something unexpected will happen. I try not to anticipate those things but just be ready. hat we see and hear, how it affects us, its the same when im playing the wheels. When I start I can’t say where it will end, so I like to leave it open to discovery. A polyrhythm is when you have contrasting ryhthms going at the same time. 2:3 is the most basic. Either beat can be felt as dominant as they play across or against each other, but they always share a common ‘One.’ These rhythms are all over my favorite kinds of music and generate a feeling of circular movement. Players and listeners are fascninated by being able to shift perspectives and feel the same thing from another point. I invited you as well to show a work in our exhibit „Wirksam vereinen. Kulturelles Erbe und zukünftige Wirksamkeit“, which fosters the question, what actuates us? My thesis is, that how self-efficacy we can act is the most important. And my idea was to research art based on the phenomenon of Flow, described by Mihály Csíkszentmihályi. Your art work shows self-efficacy and flow. And one strength of it is the perspective change. I showed ‘Equatorial Moon,’ which is a video loop of the moon taken through my binoculars (I always travel with them so I can watch birds). Once, near the equator I was reminded of the different perspective of the moon you get from standing on that position on the earth. Instead of the crescent ‘C’ shape im used to it looks like a ‘U.’ Projecting this video onto 16th century wooden pillars inside the kunstverein, further changed the moon’s shape as it bounced back and forth (due to my unsteady hand) on the carved angles of the wood. 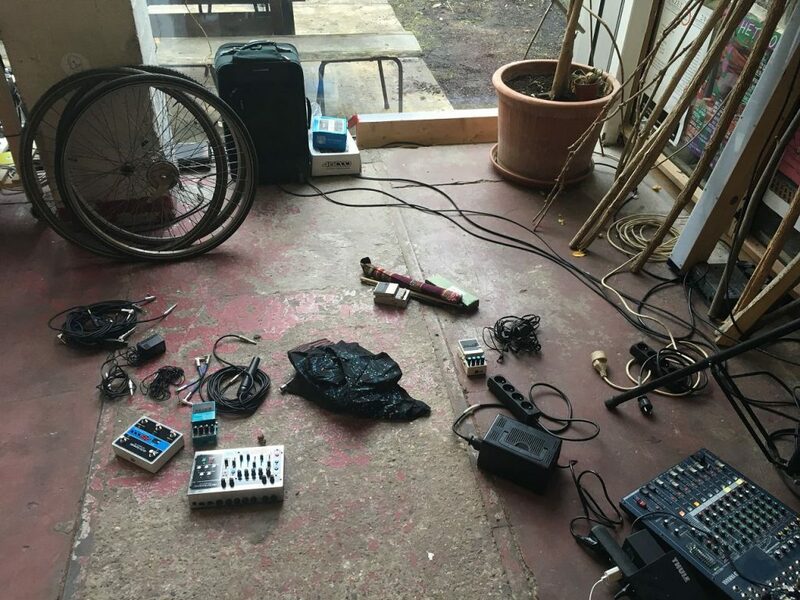 I also showed a documentation of a Flux Bikes tour from Berlin to Hamburg along the River Elbe; one evening before sunset I set up my solar-powered sound system and played next to the water. 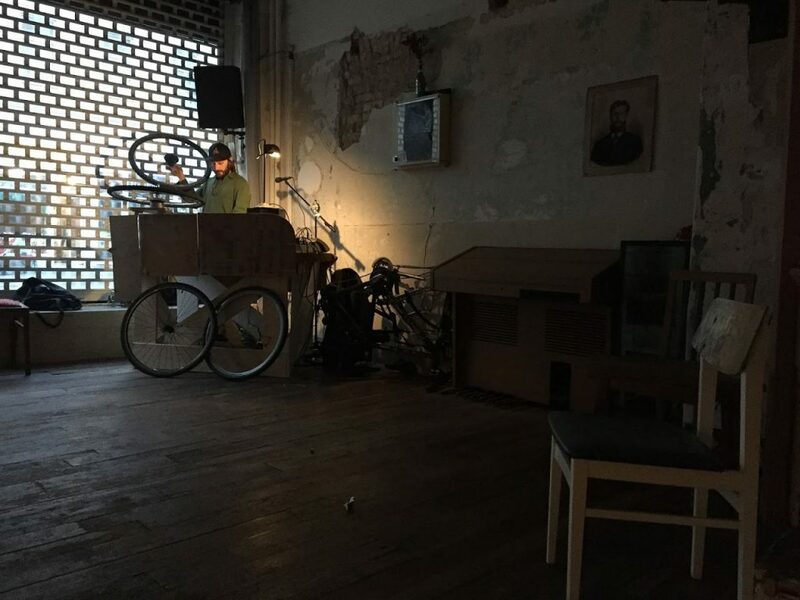 For those who couldn’t attend the opening/performance of the Wirksam Vereinen show, the video shows Flux Bikes in action. 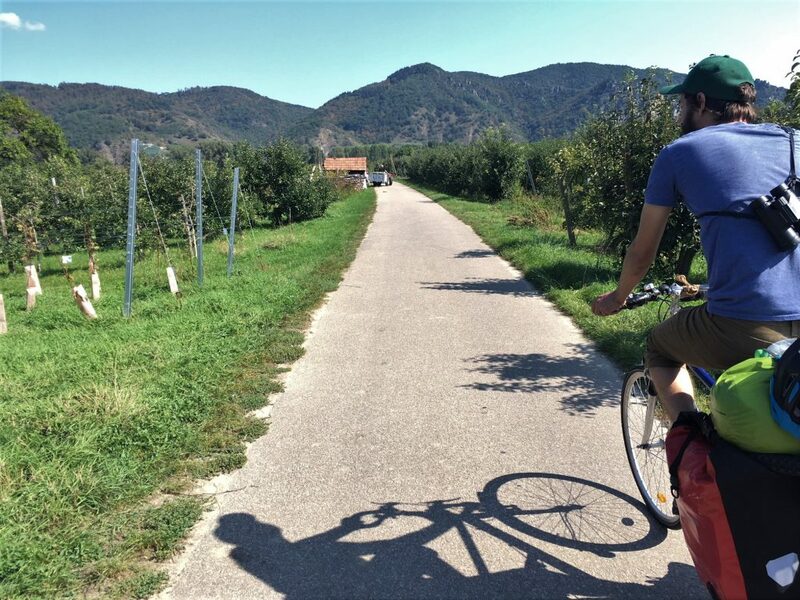 I described once that with Flux Bikes you play the stories in your music which you recorded during your bike trip with your wheel. What will be the next story? I love that image! That as the wheel rolls it absorbs every rough and smooth spot on the road, the stories and events from the ride get imprinted on the tire and then let out again at the performance. Besides riding to my performances locally, I tour somewhere different each year. Its true that plans change constantly, so currently Im planning to ride along the Donau to Vienna in the fall. Music brings me to different places. First from St. Louis Missouri to Chicago to study music. Then from Chicago all around the world with different bands and my own projects. Chicago has remained my ‘breeding ground,’ especially in the summer time it’s a frenzy of activity here between working and playing music. A seasonal pattern has developed in my life/practice. In fact im away from Chicago about half of the time. Usually I will be on tour (migration) in the spring and fall and tend to spend the winters in a sort of hibernation. It’s cold, everything slows down, so I stay inside to practice, record and plan for what’s next. I invite different artists to Ulm to have an exchange. Its quite important to the City, we don’t have an art academy here and the university is concentrating more in science than in human sciences/ liberal arts. You played on the streets of Ulm during the building of the exhibit. How was that? How was your contact with the people in that small town in the federal German state of Baden-Württemberg, situated on the River Danube? Was it international? 3 Questions at once, sorry! Most artist in Germany have to have a „Brotjob“ means a job to earn their bread. How does it work for you? Yeah, everyone finds their niche in order to survive. Besides playing music or doing sound I like to work outdoors. I have worked in gardening, conducted bird surveys, taught park district camps and skiing, done painting and handy work. My favorite is field work because it gets me out of the cities. Actually I have the idea in my mind that everyone gets paid for ther work in a more realistic way. I think its important to have other things around art and music to be involved in, but its a bad situation that still artists and musicians are not well paid for doing shows and exhibits. I think thats also a bad part of temporary migration. Like that artists are often in a constant state of suspension, what’s next, is it the same for you? What’s your next goal? Besides continuing my work with Flux Bikes, my next goal is to unite my efforts in nature and music. This summer Im honored to have been invited to speak at Yosemite National Park’s Parsons Memorial Lodge in Tuolumne Meadows. For my lecture/performance we will listen as a group to various bird songs; I will slow them down in order to listen more closely and play them on my flute. I will analyze their melodies, outline the work that has been done in this field by other artists and scientists, and explain what is special about avian tone production. Birds are migrants too, although it wasn’t proven and accepted by humans until the 1800’s. Their journies to and from breeding and wintering grounds are sometimes epic; we have even been learning about ourselves through studying them and there is still a lot to learn!